Grand Bassin or Ganga Talao is a sacred lake, which is about 1800 feet above sea level and is situated 2 km to the east of Le Pétrin. 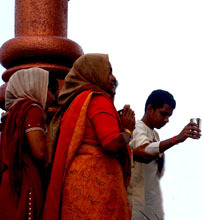 The crater lake is one of the most important hindu pilgrimage sites outside of India. 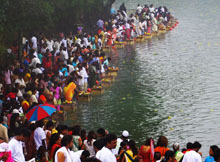 During the week there is an idyllic and calm atmosphere at Grand Bassin, whereas between the end of febuary and the beginning of march crowds of pilgrims are heading to the lake: when Maha-Shivaratree is celebrated, more than 400.000 believers make the pilgrimage to Ganga Talao to make sacrifices to their gods. According to a legend the crater lake is connected with the holy river Ganges. The god Shiva, the transformer and destroyer, and his wife Parvati were fyling around the world in a ship. Shiva wanted to show Parvati the most beautyful places on earth, so they stopped in Mauritius. During the journey, Shiva was carrying the river Ganges on his head, to prevent the earth from floodings. 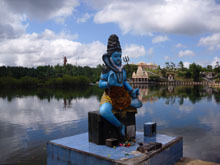 When they wanted to land in Mauritius, Shiva accidently spilled water of the holy river. Trops of it were flowing together in the crater – this is how Grand Bassin emerged. 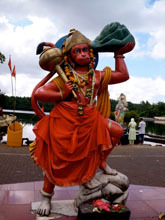 Along Grand Bassin there are several temples dedicated to Shiva and other Gods, little shrines and colourful statues. 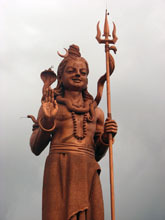 Not far from Grand Bassin one can admire an impressive statue of the god Shiva. It is 33 meters tall and is known as the highest statue in Mauritius. Tourists are welcome to visit the temples and Grand Bassin itself. Nevertheless one should follow a certain code of behaviour: Do not dress inappropriatly (no short skirts, trousers and thirts). To take photographies is allowed, but do not forget to behave respectful. Before entering the temple, please take off your shoes. Grand Bassin is one of the highlights of a holdiday in Mauritius. If you are interested in foreign cultures and religions, you should not miss out to visit the tempels and the sacred lake! 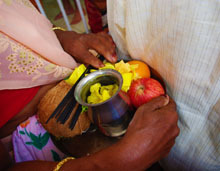 The biggest Hindu festival outside of India is taking place during my stay in Mauritius? I did not want to miss the chance to be on the spot!